Aww. It's like a dalmatian puppy that was magically transformed into a Paphiopedilum. Adorable. 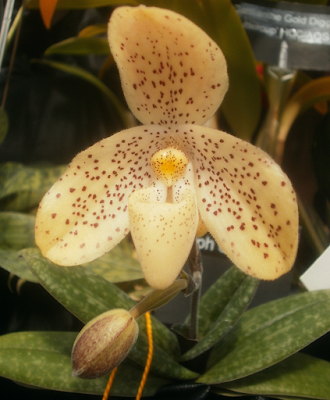 Paphiopedilum concolor is native to Southeast Asia (China, Cambodia, Laos, Myanmar, Thailand, and Vietnam), and naturally flowers in spring and autumn. Wikipedia claims it was first described in 1984, but The Plant List says 1888. (GRIN almost agrees, saying 1889.) So: off by 96 years, give or take. And Wikipedia was wrong about the parasitic orchid thing, too. Remember this the next time I quote Wikipedia about something.